A recently resigned Pennsylvania Congressman had introduced a bill to change the U.S. Constitution from two-year terms to four years for House members. Cong. 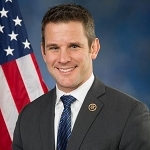 Adam Kinzinger says he’d consider such a proposal, but he doesn’t think it would be popular. However, he and other House members are caught up in the business of having to run for reelection constantly. Kinzinger says if House members ever take it up in earnest, there’ll be a lot of negative publicity about it. He believes some TV channels would claim members are just trying to stay in office longer. When the country started, the thinking was that House seats up for election every two years would keep House members’ feelings about things close to those of the people. But with so much money–and therefore fundraising–involved in politics now, members are already working on reelection as soon as an election is over. Some may be working two elections ahead. The idea behind four-year terms is to give them time to legislate between campaigns.